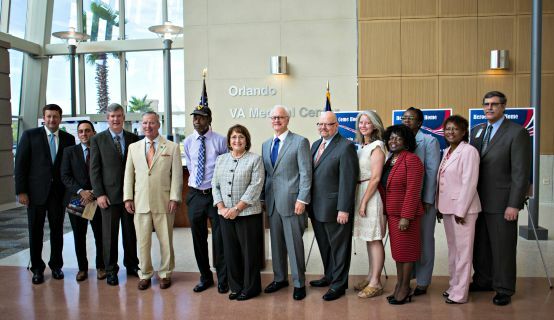 Orange County Mayor Teresa Jacobs joined Central Florida leaders at the Orlando Veterans Affairs Medical Center to discuss the findings from the Veterans Surge, a weeklong initiative led by the Central Florida Commission on Homelessness (CFCH) to help end veteran homelessness in Central Florida. The Veterans Surge, held the week of July 20, strives to end veteran homelessness by the end of 2015. CFCH is working in collaboration with the local, state and federal Veterans Affairs (VA) agencies, the nonprofit Homeless Services Network (HSN), faith organizations, community leaders and other nonprofits agencies. Across Orange, Osceola and Seminole counties, 418 homeless veterans were located by volunteers who collectively dedicated more than 2,000 hours to the outreach. The Surge was the first step of the “Heroes Come Home” initiative, which includes locating homeless veterans, housing and assisting them. The 418 men and women are now registered with the U.S. Department of Veterans Affairs, which will streamline the process for providing them with the homes and aid necessary for their stability, in partnership with local agencies, including United Way’s “Mission United” initiative. The “Heroes Come Home” initiative continues the region-wide effort to end veterans homelessness in 2015. Answering President’s Obama’s mandate to get every veteran living on the streets into housing, the collaborative plan will ensure that this goal is met in Central Florida by the end of the year. Photos from the event may be found on Flickr for use by the media.